Who: Rights & Democracy to host gubernatorial candidates Matt Dunne, Sue Minter, and Peter Galbraith. Bruce Lisman has a scheduling conflict and will join our June 12 forum in St. Albans. Phil Scott has declined to attend. 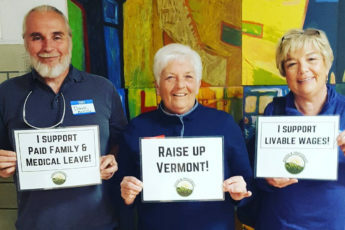 Co-sponsors include Main Street Alliance, Voices for Vermont’s Children, and the Vermont Center for Independent Living. Why: The next Governor of Vermont will make critical decisions that will shape the lives of our communities for decades. Our next governor could be the leader who will help grow a vibrant, stable, open Vermont for all families. Who are the people who want to take on this role? Where do they stand on the issues that will most affect our lives and families in Washington County? We have invited all current candidates.